From Goodreads: YOU CAN BE A VII IF YOU GIVE EVERYTHING. If she says yes, Kitty will be Masked – surgically transformed into Lila Hart, the Prime Minister’s niece, who died under mysterious circumstances. As a member of the Hart family, she will be famous. She will be adored. And for the first time, she will matter. There’s only one catch. She must also stop the rebellion that Lila secretly fostered, the same one that got her killed, and one Kitty believes in. Faced with threats, conspiracies and a life that’s not her own, she must decide which path to choose and learn how to become more than a pawn in a twisted game she’s only beginning to understand. As I started this novel, I became a little bit wary as I realized that the main character, Kitty, was contemplating becoming a prostitute, a subject I don’t want to read about, ever. And I just had a really tough time understanding her choice here, especially because she had a boyfriend who wanted to marry her. As Kitty came closer and closer to her first “night,” my stomach began to twist in very uncomfortable ways, but thankfully, prostitution is not what the story is about at all. While I was ill at ease for a little while there right in the beginning of the novel, Carter pulls a complete 180 and changes direction so fast that I nearly had whiplash—in a good way. The prostitution gig was left unfulfilled and out of mind, allowing me to breathe a sigh of relief and really get into the story. And this is where the story took off for me: as Kitty wakes up to herself Masked. Asked for the performance of her life, the only way to survive is to pretend to be one of the elite, and while that does sound kind of awesome, Carter aptly exposes all the evils that come with such a job. Suddenly, Kitty has lost what little control she thought she had over her life and must pretend to be the niece of the Prime Minister, a sick and twisted man set on ruling the country indefinitely. And from here, it’s one plot twist after another, and the events that unfold will leave readers glued to the pages and desperately wanting more when it’s all said and done. Kitty Doe is a very strong female lead, and while I disagreed with her decisions in the beginning, I really liked the person she became as the novel progressed. Surrounded by a family full of deceit and lies, her life hanging by a thread, Kitty is pulled in multiple directions at once as “family” members push, cajole, and demand her obedience or resistance. Fast paces and full of life, this story is one I’d definitely love to see on the big screen, especially as there are so many characters I love to hate. Throughout it all, it was a constant guessing game as I tried to figure out who was truly evil, and who was acting out of love, and I found it just as hard to trust those around Kitty as she did, especially as the characters seemed to change allegiances daily. Overall, this is a breath taking read that will leave readers full of emotion, yearning for more, and hoping against hope for a revolution like no other. Five stars. Harlequin Teen has been extremely gracious in allowing me to read an ARC of this novel, via Netgalley, prior to its release on November 26, 2013. 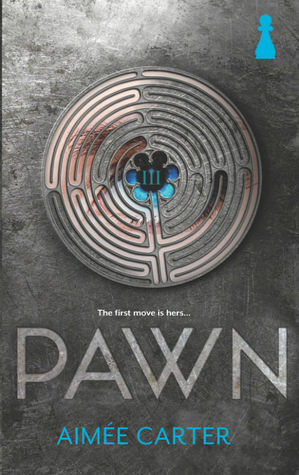 Pawn was one amazing dystopian book for me!! I loved the fact that it was quite different from the other dystopians. Great review and glad to see you loved it too. I have been reading so many great things about this book! I am glad to see that you gave it 5 stars and liked it so much even though you didn’t love the topic when you started. I like reading books with strong heroines and combined with a fast pace, this sounds perfect for me! Thanks for sharing your comments! I really enjoyed it and was definitely emotionally involved. Aimee Carter is a phenomenal writer!